Looking for a delicious curry to accompany roti, chapati for dinner? 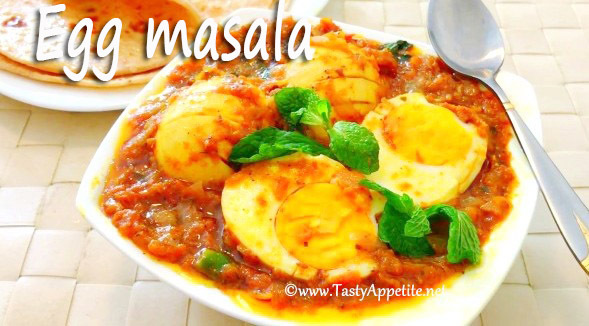 Here comes the easy egg masala curry recipe that can be prepared quickly. This is one of the most popular egg gravy and most loved by everyone. In this recipe, the boiled eggs are marinated in spicy masala and cooked along with flavorful gravy. You can check out the yummy video recipe to prepare egg curry below! Boil eggs, remove the shell. Make slits on the egg and take it in a bowl. Add salt, turmeric pwd, red chilli pwd and pepper pwd. Coat the egg well with the spice powders. Let it marinate for 5 mins. Heat 1 tsp of oil in frypan. Add the marinated eggs and roast in low flame for few minutes. Remove and set the eggs aside. Add sliced green chilli and saute. Add sliced onions aned salt. Add turmeric pwd, red chilli pwd, coriander pwd, saunf pwd and saute. Add 1/2 cup of water and cook. Once the masala thickens, add garam masala pwd and dried fenugreek leaves. Add roasted eggs and combine with the masala. Let it cook for another 5 mins in low flame. Spicy delicious egg masala is ready. It pairs up excellent with roti, chapati, biryani, pulao, etc.